By popular demand, we decided to make available to all of you jewelry-makers out there an assortment of the stone pendant beads and cabochons we use in Soul of Somanya's boutique jewelry. These stones do not necessarily come from Africa. However, the proceeds from sales still go back into Soul of Somanya's coffers to help keep our talented young Ghanaian artisans working at a living wage. 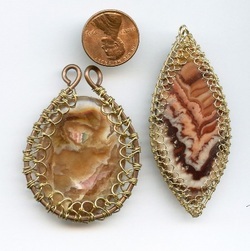 If you would like to have a pendant bead wire-wrapped like the one in the picture to the right, we will be happy to do that for you for a nominal charge. Just let us know by email after you place your order which stones you would like to have wrapped, and also in which metal: copper, brass, or non-tarnish gold, copper, silver and bronze Parawire (the best craft wire around). We will let you know what the charge will be and how to pay. If you would like to have a cabochon bezeled like the ones in the picture to the left, we will be happy to do that as well for a somewhat more substantial charge. Just let us know by email after you place your order which stones you would like to have bezeled and in which metal: copper, brass, or non-tarnish gold, copper, silver and bronze Parawire (the best craft wire around). We will let you know what the charge will be and how to pay.